Snack Girl reserves black and white photos for foods that trigger people to eat. One of my pals told me that my photo of onion rings made her hungry and ever since then I use black and white. I don't want to promote Cinnabon's famous cinnamon rolls, but I do want to help a struggling reader. I went on their website and I was disappointed that I couldn't find exactly how bad these addicting treats were. I take that as a bad sign. I would like a Cinnabon makeover! Is there anyway frosted cinnamon rolls can be healthier! Please Snack Girl, fellow doughnut lover, can you help me? Yes! I am a doughnut lover and I used to walk pass a delicious doughnut shop several times a day. I have also worked in a mall so I know the pain that you speak of - wafting smells of baking cookies (Mrs. Fields) bothering you in your store. If things are slow, you get really bored and start dreaming of a perfectly baked confection. I get it. I was able to find the nutrition information for Catie - and it isn't pretty. When I found this nutritional information, I just sat at my computer watching the cursor for a while....flashing at me. What can I say? This is just mind blowing. You would do much better eating a 260 calorie doughnut. My first suggestion is just don't go near the Cinnabon and get a glazed donut instead - and, no, I didn't think I would ever write that a doughnut is a healthier choice. They have those great cake ones dipped in cinnamon sugar - you will be doing yourself a favor by eating one of those instead of a Cinnabon. I know that Catie wants me to redo a cinnamon roll, but I think I will hold off on that and just offer some easier solutions until I get around to making my own version. I have made cinnamon rolls and they are a treat. I'm not sure that I can come up with a way to make them tasty and healthier. 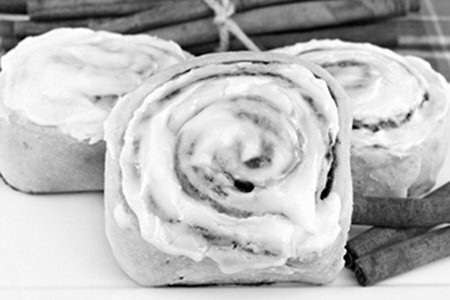 Buy a container of cinnamon and sniff it while walking by Cinnabon. This may work! You might get all the cinnamon hit you need in your nose and be able to stop yourself from purchasing a bun. Try a slice of wheat toast with the new Cinnamon spread from The Laughing Cow. You might have to sprinkle some sugar on this to make it work because it isn't very sweet - but you will get creamy and cinnamon together which is a good thing. Make cinnamon toast for a snack and bring it with you. I love cinnamon toast and if you pack it in a Glad container - it might still be fresh enough to hit that Cinnabon spot that is bugging you. When I was a kid, I used to make myself cinnamon toast as an after school snack. It is just toasted bread, butter, cinnamon and sugar. How can you go wrong? If you use whole wheat toast, you are including a whole grain with the sugar, etc. You will save 752 calories and the cost of a Cinnabon by bringing this with you to work. Give it a try, Catie, and let me know if it works. How do you deal with Cinnabon? The Laughing Cow product was received for review consideration. No other compensation was provided. Mix sugar and cinnamon in a small bowl. Toast the bread, spread the butter on it, and sprinkle with sugar cinnamon mixture. You will only need 1/2 of the sugar mixture to make your toast taste delicious. Save the rest of it for another Cinnabon attack. Homemade Apple Raisin and Cinnamon Bran Muffins – A Great Snack! Augh, it's just a bleached flour carb fest, and I need to eat better. The two Cinnabon stores close to me have closed. That's the way I've dealt with my love of all things Cinnabon. Which is basically cheating, since it's not like I'm walking past the store in the mall anymore. I'm going to say I'm dealing with it the same way I deal with the carrot cake at my favorite restaurant that is only open during the summer months at the Jersey Shore: I told myself I could have one piece of carrot cake each summer month. So far in June...haven't had any yet! So, if a Cinnabon store opens again near me, I might chose the same way of dealing with it. One every three months? Something like that. How about apple slices sprinkled with cinnamon sugar? When I need the sweet cinnamon fix I use 1/2 Lavish flat bread (2 ww pts for the whole piece)sprinkle a small amout of brown sugar blend and cinnamon, spray a little zero fat parkay on top pop it under the broiler until bubble...cut into 1 inch squares with pizza cutter...perfect for me. That is the best plan I've seen. Remember that it isn't the one you eat that kills you, it's the one a day. Eat healthy food 20 times a week knowing that 21 is going to be so bad for you that you need another 20 before you can do it again lol. Like Melissa, I think the once every long while is OK - I only let my kids get Cinnabon at the airport - and of course I have some (we don't fly very often!) so it may be once a year. I have 2 boys, so we are not big mall-dwellers. But, recently succumbed to Wetzels Pretzels cinnamon pretzel bites at the mall - my son didn't even finish the huge container, but I kept picking at it. But really, the smell is better than the taste... Especially, after the first bite or two. Could you eat a 1/4 and freeze the other sections to reheat? They make those yummy cinnabon/pretzel/cookie smells so you will want them (obviously!) - what about going the other direction? - some minty gum - eating before you go? Thanks for sharing the calories, SG, even worse than I imagined! Rachel, that sounds delicious! And you could probably use the low fat cream cheese too, if you wanted. I think I would be satisfied with this 90% of the time. And the other 10%, I would be too lazy to drive as far as I have to right now to get a Cinnabon!! Have you tried Holey Donuts? They are amazing and very low in calories. They are pricy so I buy when they are on sale and keep them in the freezer. My son loves these as a treat! PS I am not affiliated with this company, just found their products and they are good! We sprinkle flax seed on our cinnamon toast to add more nutritional value. No change in taste and good for you!! I just wanted to concur with Charlene about Holey Donuts. They are DELICIOUS but so so pricey. Before I lost my job, they were a staple of my freezer. the cinnimon middles especially. I'm not sure what makes cinnabons so fattening - i would think a baked roll with cinnamon and raw sugar mixed with stevia and a little butter would hit the same spot. I loved Holey Donuts and can't wait until I hear that they've opened a retail store in NYC (so i can buy a few and not pay for shipping!) They seem to have been saying they would do this for years now, so I'm not holding my breath! I just toast a whole grain english muffin, then top it with butter, cinnamon and honey. Delicious! What about substituting Truvia or Splenda for the sugar making it even healthier?? Hey, I am so with Catie on this. I LOVE cinnamon...it's my biggest weakness. I used to eat two of the huge Entemann's (sp?) cinnamon buns every Sat and Sun morning when I first moved into my apartment. I gained 30 lbs. I didn't realize how fatty they really were. If you are lazy like me and you need a cinnamon fix (and I'm not sure how healthy this is but...) the Pepperidge Farm cinnamon swirl bread is delicious on its own or toasted. It gives that over-the-top cinnamon taste and I think it has a lot less calories. I also agree with the lady who posted about the non-fat cinnamon latte. I love the non-fat, no-whip Cinnamon Dulche latte at Starbucks. It also works to curb the cinnamon craving. You can get it iced as well. It's a little pricey, but it does satisfy that cinnamon craving, and you can sip it for a while. Michelle I like your idea about the apple slices with cinnamom sugar. I like Vietnamese cinnamon because it has a very robust flavor. I sprinkle that and a little sugar on a slice of toasted Ezekiel cinnamon bread with some whipped cream cheese or greek yogurt. It's creamy, warm, cinnamon and sweet. Holey Donuts did have a retail downtown NYC but it closed pretty quickly.